This is, I believe, one of Nerd Lacquer's first collections. All three are beautiful jelly bases packed full of glitter. I was lucky enough to nab these the last time Nerd Lacquer opened shop. My second favorite. 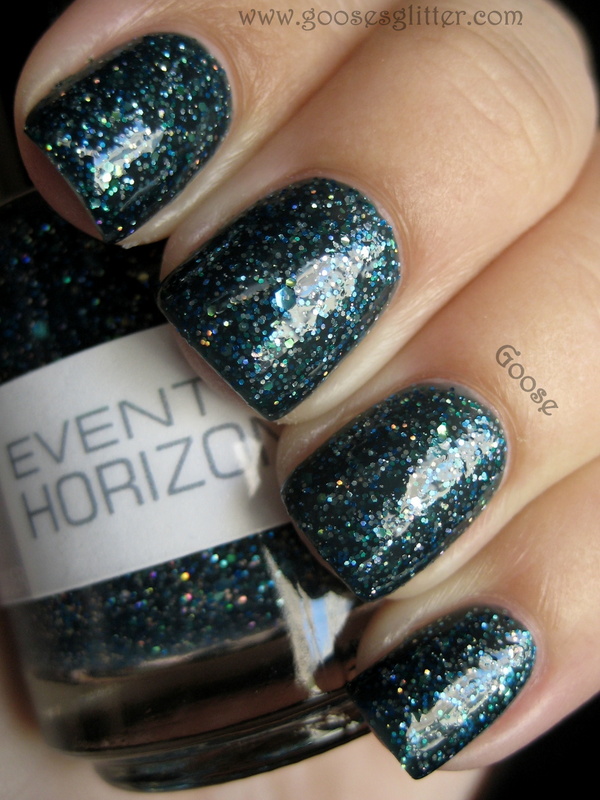 Event Horizon is a dark teal jelly base with teal and silver and gold holo glitter (from what I can tell). Again with the juicy, gorgeous jelly base! I didn't put a top coat on for this swatch, but it is just as smooth as Nebula with Gelous and Seche Vite. Two easy coats with the same fantastic formula. It's a tiny bit more green than it shows in the picture. 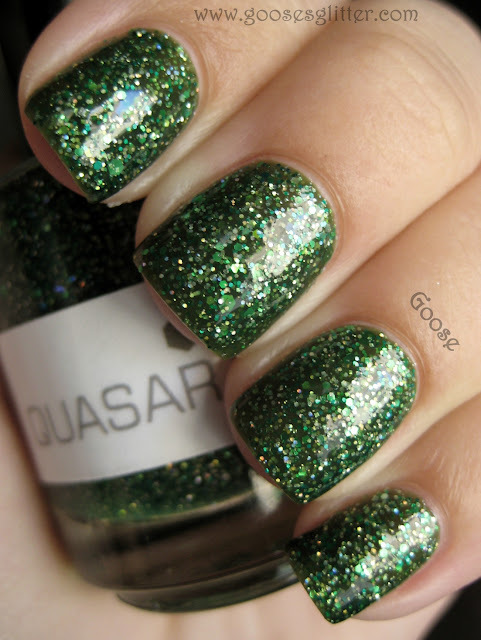 Quasar is a swampy green jelly base with tons of green and silver holo glitter. Two coats and no topcoat shown. Even though greens are normally my favorite, this one had tough competition with Nebula and Event Horizon. Even so, it's quite beautiful, and I'm really glad I got the set of the three. This collection is so yummy. I love the squishy jelly bases in all of them, and the glitter combinations are just stunning. Chunky large glitter is cool, but my favorite glitters are the mixes of small or micro glitter with some medium contrasting glitters mixed in (like Big Money and Diamond in the Rough). These can be a bit tricky to get a hold of because of the shop's popularity. Last time the shop opened, they sold almost 1500 bottles in 18 hours and had to close to make sure they could meet their 5-7 day shipping quota. These can be purchased directly from Nerd Lacquer's Etsy shop, as well as at Harlow & Co, and Ninja Polish. You can sign up to be notified when Nerd Lacquer's shop reopens or when the products are in stock on the other two sites. I love the Nebula color! 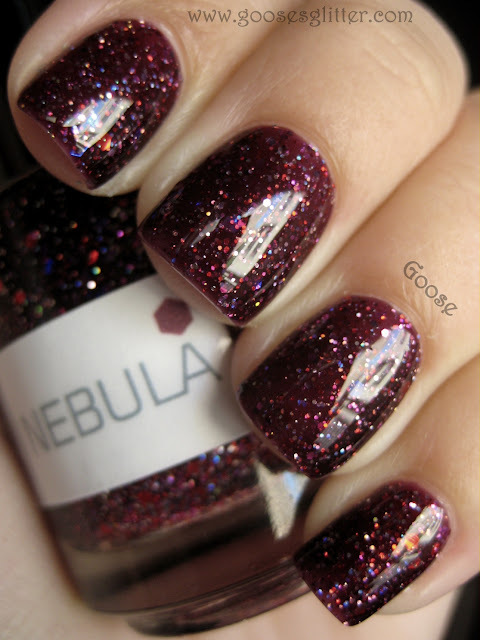 Nebula is so gorgeous! Love it! Very, very pretty all of them, nice swatches! You have gorgeous nails, and you are an awesome photographer. I'm following you! UGHHH, I wish I would have gotten Nebula...and Event Horizon....and Quasar LOL! I love the five I picked up though!